While product availability for Nozoil® Nasal Spray grows, consumers have the opportunity to try before they buy through the McKeon Products free sample giveaway program. Consumers now have an opportunity to try before they buy the nasal spray, as McKeon Products, Inc. is giving away a limited number of free samples on the Nozoil® Nasal Spray website. Nozoil® Nasal Spray, from the makers of Mack’s®, the #1 doctor recommended brand of hearing protection products, has been gaining momentum since its U.S. introduction this year. Nozoil® Nasal Spray is a unique Swedish formula that provides relief for dry noses, stops itchy nose sensations, and decreases the formation of nasal crust, and is exclusively available through McKeon Products in the United States. This innovative nasal spray is available at the following stores: Harris Teeter, Ingles, Kinney Drugs and Pharmaca Integrative Pharmacy, and online through Drugstore.com and Walgreens.com. Since product availability may vary from store to store, calling ahead to verify availability is recommended. Nozoil® provides an all natural, drug-free remedy to moisturize and condition the delicate and sensitive nasal passages. This clinically proven Swedish formula uses 100% pure sesame oil, rich in antioxidant Vitamin E, which is supportive in reducing the destructive effect of free radicals. Free from allergy causing proteins, Nozoil® lubricates and moisturizes while providing relief from itchy and burning sensations. Nozoil® helps support the body’s natural defenses and is ideal for relieving the effects of allergies, illnesses, and dry environments. Research shows that Nozoil® Nasal Spray proves to be more effective than traditional saline sprays. 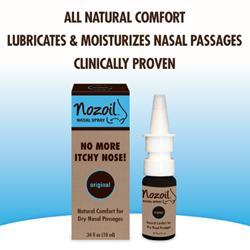 Consumers with dry nasal mucous membranes experience less nasal problems after using Nozoil®. When nasal mucosa dryness due to dry winter climates was treated, pure sesame oil was statistically shown to be significantly more effective then ISCS (isotonic sodium chloride solution), or traditional saline spray. Consumers who use Nozoil® can experience fewer colds, as the greater need to touch, scratch, and pick the nose will be diminished, as rhinovirus (common cold) is transferred due to touching the nose. For detailed information on the supporting research studies, please visit the Nozoil® Nasal Spray website. For over 50 years, McKeon Products, Inc. has led the hearing protection and ear care industry with its Mack’s® brand line of products. Mack’s® provides the #1-selling and original formula Mack’s® Pillow Soft® silicone ear plugs. Mack’s® is the #1 doctor recommended ear plug brand in the U.S., with an extensive variety of ear plugs designed for sleep, travel, music, swimming and overall noise reduction. Mack’s® is the #1-selling brand of ear plugs, as well as the official earplugs of USA Swimming®. Today, McKeon Products, Inc. manufactures a full range of health care products for consumers, including hearing protection, nasal care and breathing improvement products. The Mack’s® line of products includes moldable, pre-molded and foam earplugs, ear drying aids, earwax removal aids, nasal devices, sleep masks, musicians’ ear plugs, ear muffs, and screen and lens wipes. McKeon, an ISO 9001:2008 quality certified company, is committed to supplying the highest quality, innovative consumer products.